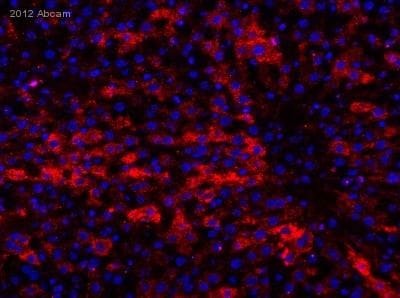 Rabbit polyclonal SREBP1 antibody. Validated in WB, IHC, ICC/IF and tested in Mouse, Rat, Human. Cited in 24 publication(s). Independently reviewed in 9 review(s). Mouse and rat liver. Rat kidney. Our Abpromise guarantee covers the use of ab28481 in the following tested applications. WB 1/500 - 1/5000. 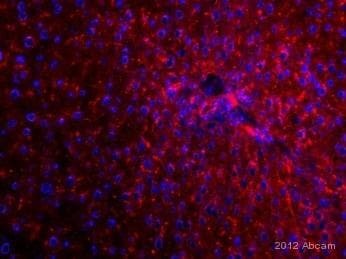 Can be blocked with Mouse SREBP1 peptide (ab31099). Detects an ~68 and 120 kDa protein representing SREBP1 in mouse and rat liver samples as well as rat kidney samples. A predominant band at ~68 kDa (active cleaved site) is seen and a band at ~120 kDa (inactive precursor) may not be seen or it may be diminished. Transcriptional activator required for lipid homeostasis. Regulates transcription of the LDL receptor gene as well as the fatty acid and to a lesser degree the cholesterol synthesis pathway (By similarity). Binds to the sterol regulatory element 1 (SRE-1) (5'-ATCACCCCAC-3'). Has dual sequence specificity binding to both an E-box motif (5'-ATCACGTGA-3') and to SRE-1 (5'-ATCACCCCAC-3'). The left image is a negative control in the absence of ab28481, the right image is in the prescence of ab28481, the secondary and counterstains. ab28481 staining SREBP1 in mouse kidney tissue sections by Immunohistochemistry (IHC-P - paraformaldehyde-fixed, paraffin-embedded sections). Tissue was fixed with formaldehyde and blocked with 5% serum for 15 minutes at 25°C. Samples were incubated with primary antibody (1/2000 in goat serum) for 12 hours at 4°C. A Biotin-conjugated goat anti-rabbit IgG polyclonal (1/500) was used as the secondary antibody. 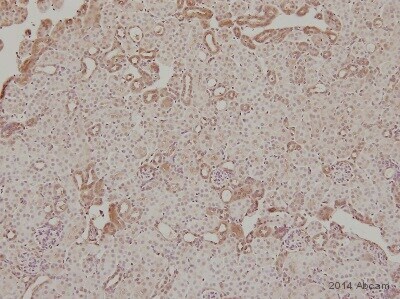 ICC/IF image of ab28481 stained HepG2 cells. The cells were 10% formaldehyde fixed (10 min) and then incubated in 1%BSA / 10% normal goat serum / 0.3M glycine in 0.1% PBS-Tween for 1h to permeabilise the cells and block non-specific protein-protein interactions. The cells were then incubated with the antibody (ab28481, 5µg/ml) overnight at +4°C. The secondary antibody (green) was ab96899, goat anti rabbit DyLight® 488 IgG (H+L) used at a 1/250 dilution for 1h. Alexa Fluor® 594 WGA was used to label plasma membranes (red) at a 1/200 dilution for 1h. DAPI was used to stain the cell nuclei (blue) at a concentration of 1.43µM. Immunohistochemistry (Frozen sections) - Anti-SREBP1 antibody (ab28481)This image is courtesy of an anonymous abreview. Immunohistochemistry (Frozen sections) analysis of mouse liver tissue labeling SREBP1 with ab28481 at 1/200 dilution. Tissue was fixed in acetone followed by blocking with 10% serum for 1 hour at 21°C. The tissue was stained with ab28481 at 1/200 for 12 hours in PBS+0,1% Triton X at 4°C. 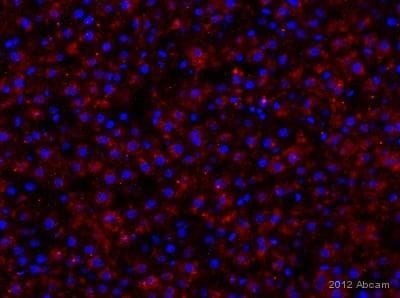 A polyclonal goat anti-rabbit Alexa Fluor® 594 secondary antibody was used at 1/1000 dilution. Immunohistochemistry (Frozen sections) analysis of rat liver tissue labeling SREBP1 with ab28481 at 1/200 dilution. Tissue was fixed in acetone followed by blocking with 10% serum for 1 hour at 21°C. The tissue was stained with ab28481 at 1/200 for 12 hours in PBS+0,1% Triton X at 4°C. 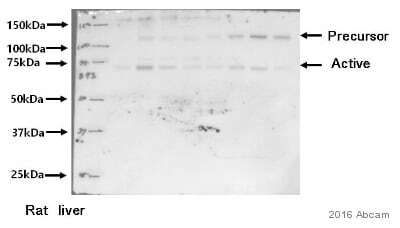 A polyclonal goat anti-rabbit Alexa Fluor® 594 secondary antibody was used at 1/1000 dilution. Immunohistochemistry (Frozen sections) analysis of rat liver tissue labeling SREBP1 with ab28481 at 1/200 dilution. Tissue was fixed in acetone followed by blocking with 10% serum for 1 hour at 21°C. The tissue was stained with ab28481 at 1/200 for 14 hours in PBS+0,1% Triton X at 4°C. A polyclonal goat anti-rabbit Alexa Fluor® 594 secondary antibody was used at 1/1000 dilution. Publishing research using ab28481? Please let us know so that we can cite the reference in this datasheet. What does this mean? does ab28481 detect SREBP1c? The immunogen for ab28481 is conserved in all isoforms of SREBP1, and it should detect SREBP1.C. I hope this helps, please let me know if you need any additional information or assistance. The below given list of antibodies were purchased from u. Is it possible to send the molecular weights of the antibodies. The observed would be ˜75kDa. ab30532; the observed band would be 110, 130 and 160 kDa. Please check the literature for more information about observed band sizes.